John Kerry is calling on old friends in the hopes of softening Senate opposition to the President Obama's climate pact with China. 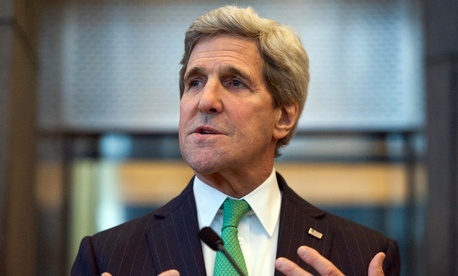 According to a State Department official, Kerry reached out to Republican Sens. Bob Corker and Lindsey Graham to discuss the new U.S.-China agreement. Both lawmakers are expected hold important positions for the climate pact when Republicans take control of the Senate when the next Congress convenes. Corker is slated to lead the Senate Foreign Relations Committee, and Graham will control the Appropriations Committee panel that oversees spending for the State Department and foreign operations. Kerry also reached out to Vermont Democrat Patrick Leahy, the outgoing chairman of the panel Graham is about to gavel. On Tuesday, after months of delicate talks with the United States, China announced a first-time date—2030 at the latest—for a peak in its surging carbon emissions, as well as plans to generate 20 percent of its energy from nonfossil fuels by the same date. The U.S. simultaneously unveiled a pledge to cut greenhouse-gas pollution by 26-to-28 percent below 2005 levels by 2025, which builds on the existing pledge of a 17 percent cut by 2020 and accelerates the rate of pollution reduction. Republicans have pilloried the president over the new agreement with China, but Kerry—who spent decades in the Senate representing Massachusetts—is hoping for a gentler reception from the two senior Republicans. The State Department official called the discussions part of normal outreach on such issues by Kerry. Graham and Kerry have a history on climate change. In 2009 and 2010, they and now-former Sen. Joe Lieberman spent months negotiating on a sweeping climate-change bill. But Graham ultimately walked away from the talks, dealing a critical blow to efforts to craft a measure that could draw some Republicans. The legislation that then-Sens. Kerry and Lieberman produced died without ever coming to the floor. Corker also has a reputation of being among the more conciliatory lawmakers in the chamber, having worked across the aisle on the financial bailout, Wall Street regulation, and elsewhere. Graham, a frequent critic of White House foreign policy, did not join other Republicans in slamming the emissions agreement with China when asked about it Wednesday. But Graham said he's planning oversight after the new Congress convenes. "When it comes to climate change, here's the question: Is this Chinese agreement ... will it help create jobs in America?" "The administration is going to have their work cut out for them convincing the Congress that going to a low-carbon economy will be good for our economy. I think there's a case to be made that a low-carbon economy, implemented over time, is not inconsistent with a robust economy," Graham said in the Capitol. Among most Republicans, however, the plan is drawing scathing attacks, with critics arguing that the U.S. cuts will hinder the domestic economy while emissions from China, an economic competitor, will keep rising for years. "Once again, this administration is putting American workers and our economy at a tremendous disadvantage to the rest of the world," said Sen. John Barrasso, a Wyoming Republican who is part of the GOP's Senate leadership team. The new U.S. emissions pledge does not require congressional approval, but Republicans can use their new majority to launch inquiries and political attacks against it, and U.S. officials are seeking to counter the criticism. Alongside the Kerry's person-to-person push, top Cabinet officials are also making public appeals. EPA Administrator Gina McCarthy used appearances on CNN and MSNBC on Thursday to tout the deal and dispute GOP claims that it would hinder the U.S. economically. "There is tremendous opportunities for us to continue to grow the economy, create jobs, and provide ... public-health protections," she said on MSNBC, calling the targets "aggressive but affordable" for the U.S.
"We also know that China will have to take immediate action if they can expect to achieve the kind of reductions that they will need to achieve, and investments in renewable energy that it is going to take to peak their emissions no later than 2030 and to bring these kinds of renewables into the mix in China," McCarthy said.